"Approximately 500,000 pre-stressed concrete cylinder pipes have been manufactured to date Over 3,700 km of haul roads was constructed alongside the pipe line trench to enable the heavy truck – trailers to deliver pipe to the installation site Phase I Total Length 1,600 Km. 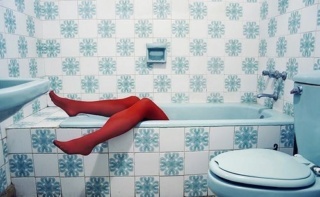 Phase II Total Length 2,155 Km. Volume of Trench Excavation 250 Million Cubic Meter. Total Weight of Cement used 7.0 Million Tones." An international team of engineers in Baikonur Cosmodrome, Kazakhstan, is finishing preparations for the historic launch of the ExoMars mission on March 14, 2016. Following their arrival to the launch site at the end of 2015, the Trace Gas Orbiter, TGO, and the Schiaparelli lander were tested, put together and will join their Proton rocket in the first week of March. The ExoMars 2016 spacecraft - the Trace Gas Orbiter (in the background) and the Schiaparelli lander (in the center) - in a clean room insideFacility 92A-50 in Baikonur Cosmodrome on Dec. 25, 2015. By the end of January 2016, an army of around 65 people assembled in Baikonur to conduct final assembly and testing of the ExoMars-2016 mission before its launch. The team included engineers from the project's prime contractor at French and Italian divisions of Thales Alenia Space, as well as specialists responsible for mission's scientific instruments. 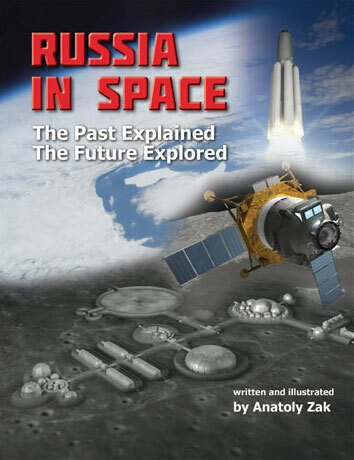 Russian engineers were working on the integration of the spacecraft with the launch vehicle. The ExoMars-2016 launch campaign was expected to cost Russia 776.3 million rubles, including 239.9 rubles in 2015 and 536.4 rubles in 2016. The pre-launch processing was briefly interrupted for a Proton launch with the Eutelsat-9B communications satellite on Jan. 30, 2016. Because ExoMars would require a great deal of time and space at Facility 92A-50, no other Proton missions were planned within a month and a half leading to the opening of the window to Mars on March 14. 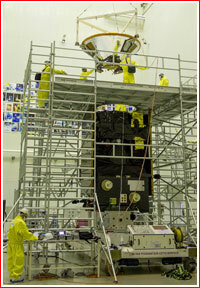 The TGO processing included communications checks between all spacecraft components and its four instruments. The Russian-built FREND instrument had to be replaced with a backup model, due to problems discovered several months earlier. Prior to fueling of the TGO spacecraft with its toxic and highly corrosive propellant, the vehicle's fueling plumbing was filled with helium to ensure absence of leaks. Subsequent checks with a special mass spectrometer detected no helium escaping from any valves. 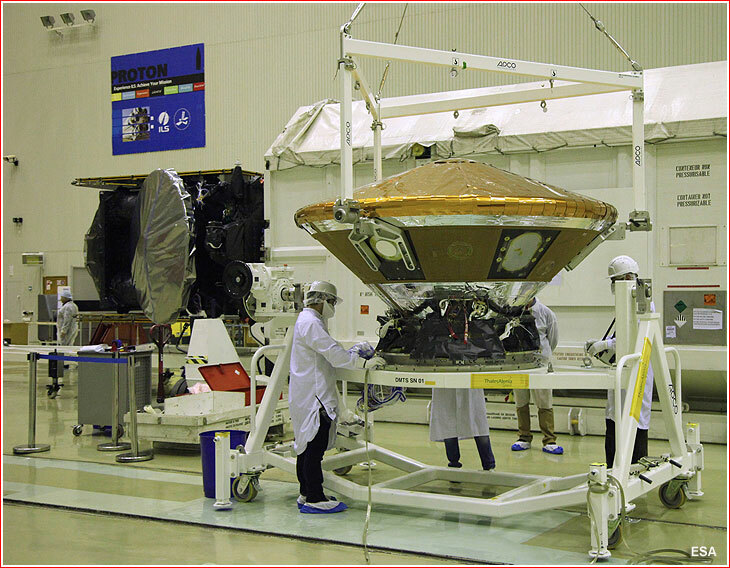 The TGO's batteries were then charged, the final sheets of thermal insulation installed and, after final inspection, it was ready for integration with the lander. Although the orbiter for the ExoMars-2016 mission was being prepared inside a processing hall of Facility 92A-50, which guaranteed clean-room environment at level ISO-8, it was not enough for Schiaparelli. Because the lander was designed to reach the surface of Mars, it had to be free of not just dust but even bacteria or microbes, which could have a chance to multiple on another planet. A special tent for super-sterile operations at clean-room level ISO-7 was set up inside the processing hall. A specialized microbiological laboratory from Turin, Italy, was also set up next to the facility to ensure that the lander was completely sterile. Once Schiaparelli was brought inside its "clean room within a clean room," its clamshell capsule was split into a front heat shield and a back shell. The lander could now be taken out for the installation of a special gas generator, which would be used for the opening of the parachute during the descent in the Martian atmosphere. The ship's explosive bolts, which would separate the heat shield during landing were also checked. The spacecraft also undergone electric and leak checks. Engineers also uploaded the final version of the software into Schiaparelli's computers and charged its batteries. The fueling of the lander was conducted between January 28 and January 31. During the first half of February, specialists from the Airbus Defense and Space team glued most of the thermal protective tiles on the back shell of Schiaparelli's heat shield. The lander was finally attached to the top of the spacecraft on February 12, and the next day, all the electrical connections between the two spacecraft were made, allowing to start functional checks, which continued until February 15. On February 21, the fueling of the TGO began with 2.5 tons of propellant. The propellants for the spacecraft were procured from Gerling Holz in Germany and had to be brought by ship to St Petersburg in Russia, and then by train to Baikonur. 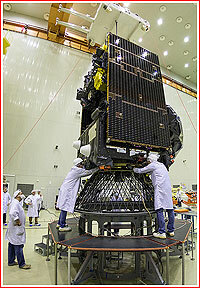 The final integration of the ExoMars-2016 with the launch vehicle begins on Monday, February 29. The fully assembled and fueled TGO/Schiaparelli stack will be first placed on top of the Briz-M upper stage, which would act as a space tug during the launch, conducting four maneuvers to enter Mars-bound trajectory. Between March 2 and March 3, the payload section including the upper stage and the spacecraft will be rotated into a horizontal position and enclosed between two halves of the Proton's payload fairing. The resulting upper composite will then be attached to the three-stage Proton rocket on March 5, 2016. The fully assembled launch vehicle and the spacecraft will then be rolled to the outdoor fueling station, where Briz-M tanks will be filled with hypergolic propellants and pressurized gases. On March 11, the launch vehicle is expected to arrive at Pad 39 at Site 200 in Baikonur for the countdown and liftoff on March 14, 2016, at 09:31:42 GMT. January 5: The TGO orbiter attached to a composite structure of the launch vehicle adapter. January 7: The TGO orbiter moves into the fueling area inside Facility 92A-50 for initial leak tests. 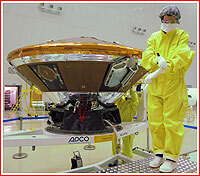 January 28-31: The fueling of the Schiaparelli lander is conducted in Baikonur. February 12: A Proton rocket for the ExoMars-2016 mission arrives at Baikonur's Site 92A-50 for the pre-launch processing. 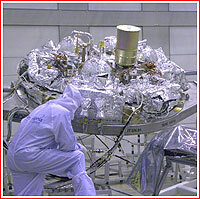 February 12: The Schiaparelli lander is integrated with the Trace Gas Orbiter. February 17: Sealing of the Schiaparelli's heat shield is completed and the assembled spacecraft makes radio-contact with its mission control in Darmstadt, Germany. February 21: The TGO fueling begins in Baikonur. 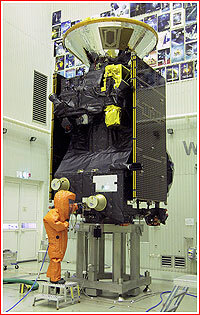 February 29: The TGO/Schiaparelli stack to be integrated with its Briz-M upper stage. March 2-3: A payload section to be encapsulated under payload fairing. 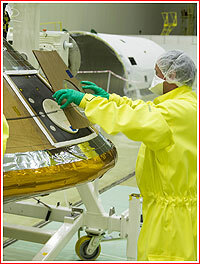 March 5: The ExoMars-2016 spacecraft composite to be integrated with its Proton launch vehicle. March 11: The Proton-M launch vehicle with ExoMars-2016 to roll out to launch pad at Site 200. March 14, 09:31:42 UTC: ExoMars-2016 liftoff. Ma jeba te Gadafi u usta podla lajava. Kakve veze imaju ubojice Gadafija sa -PROJEKTOM- koji je kao takav gigantski i za svaku pohvalu. cjevovod ( cijevi betonske promjera 4 Metra ) koje su dovodile pitku, slatku vodu milijunima gradjana. Projekt, kao takav, je za svaku pohvalu i to nitko ne može negirati. I danas bi bio u funkciji i spašavao stotine tisuća ljudi od žedji i gladi, navodnjavao bi polja itd. samo kako bi pokazao....................šta ono.........ah da-------Podmuklost i jadno stanje duše "
da ponovimo još jedan put, za one tupe koji još nisu skužili o čemu je tema. Tako bi neki tamo----sero--- rekao i za Piramide u Gizi................."
bleeee, a kako je taj Faraon završio, kosti mu raznijeli, razvalili sarkofag.......šza je on, ništa "
Jadna majko kakvih debila ima tu.